As part of the Travel Penticton, Youth Influencers Program, KVR Middle School students were tasked with writing blogs focusing on four key traveler types: Adventurers, Athletes, Families and Foodies. Below is the second in a series that will be released over the next few weeks. We hope that you enjoy these insightful and candid reviews by our local youth and that they encourage you to visit our wonderfully diverse City. Penticton is THE place to be for family fun. There are all sorts of super amazing activities like walking on the beach or riding on a quad bike. There are 2 different beaches in Penticton which gives you lots of options on what activities you want to do that day. The most popular beach is Skaha Beach which has a boat launch, stores, ice cream, slides and more! It’s also a lot of fun to just relax and swim and have some family fun. Because Penticton sits on not one, but TWO lakes, there is also a beach on the other side of the city called Okanagan Beach. It has warm water and fun activities like the Wibit. The Wibit is a big floating bouncy castle with lots of obstacles and climbing challenges for all ages. In the evening after you have dinner and ice cream at the nearby restaurant, Patio Burger, you can light up a bonfire to get warm right on the beach! A family enjoys a beach day at Skaha Lake in Penticton, BC. But if you are not into having too much sun and sand, there are many more activities like going out for some family fun at some of our biggest events here in town including Peachfest and Ribfest. Every year in August we have the Peachfest which is the most popular event we have each year. It includes lots of entertainers and performances like singing, dancing and even hypnotists and a TON of great food from food trucks. It’s amazing for a day out with the family. That’s not even all, right beside where all these amazing performances are, in Rotary Park, there is a carnival with lots of rides for all ages from the little dragon roller coaster to the zipper, anyone can have fun. 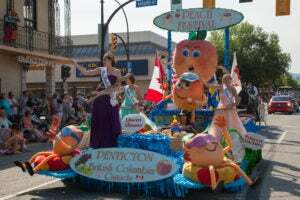 There is also the the annual Peachfest parade which has colorful and fun floats to watch down the road. Another super fun family event is Ribfest. Every year in July, Rotary puts on Ribfest which is an event where volunteers put on fun activities and make lots of delicious ribs for only a small price. Another great family activity to try is to climb the ‘Penticton Sign’ on Munson Mountain, which is a very popular spot for tourists. Penticton’s mountains are filled with trails for family’s to have adventures on. If you get too tired from all the activities, then just walk a few feet up the road and you will find Downtown Penticton, that has many stores such as ice cream shops, book stores, thrift shops, clothing stores, and more. Penticton has tons of restaurants downtown to eat at with friends or family. 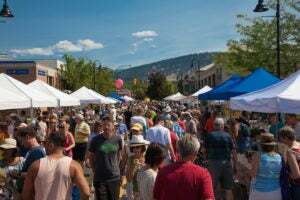 Every Saturday, downtown has a market, that has food from all over the Okanagan and activities like bouncy castles for the little ones and wine tasting for the adults. Penticton is fun for families all year round – so make sure to come to Penticton for family time all the time.